​Proc Freq is another commonly used statistical procedures in SAS. It computes the counting statistics on categorical variables. 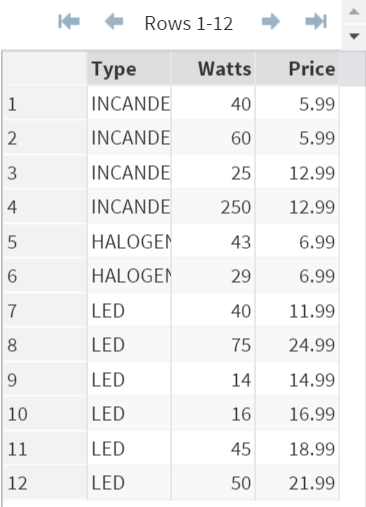 The BULBS data set contains a list of light bulbs sold at a convenience store. We can count the number of light bulbs of each type using Proc Freq. 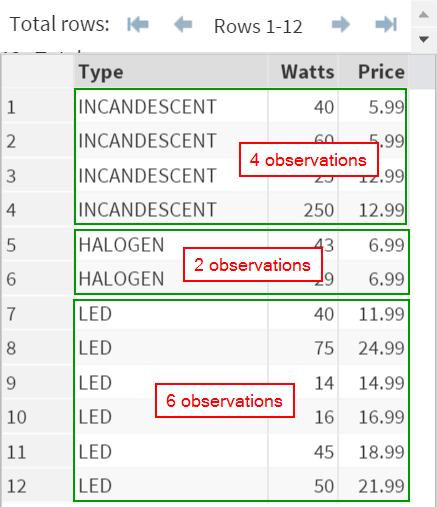 The TABLE statement tells SAS to count how many times each type of light bulbs appear in the data set (i.e. frequency statistics). The halogen light bulb appears 2 times in the data set while the incandescent and LED light bulbs appear 4 and 6 times, respectively. The procedure correctly computed the frequency statistics for each type of light bulbs. Frequency/Counting statistics offer great insights about the distribution of the data. ​You will learn a few more examples later in this module. The GUMSALES data set contains a list of transactions for the 3 brands of gum. Count how many times each brand of gum is being sold.